As new emerging networking standards, 40G and 100G network have been achieved initial success. But they are based on the 10G network. With the growing numbers of small business enterprises, 10G SMB switches are also in a large demand. TP-Link has introduced the T1700 Series 10G Smart Switches: the T1700X-16TS Full 10 Gigabit Smart Switch and the T1700G-28TQ Gigabit Stackable Smart Switch with 10G Uplink. They provide high levels of performance and the increased scalability that meet the requirements of SMBs. This article would introduce the T1700G-28TQ and its compatible optics. As one of the TP-LINK’s Gigabit stackable smart switches, the T1700G-28TQ is able to provide reliable, cost-effective and resilient networking solutions for SMBs. The switch is equipped with 24 10/100/1000Mbps RJ-45 ports and 4 dedicated 10G SFP+ slots which can be used for uplinks and/or stacking, providing a strong interconnection between access and aggregation. The T1700G-28TQ supports rich L2 features, including 802.1Q tag VLAN, Port Isolation, Port Mirroring, STP/RSTP/MSTP, Link Aggregation Groups, and 802.3x Flow Control function. Besides, T1700G-28TQ supports L2+ feature static routing, which provides simple network segmentation by routing internal transmissions to make the ow of network traffic more efficient. The stack system of T1700G-28TQs supports up to 40Gbps bi-directional stacking bandwidth with built-in redundancy and auto-failover. The switch supports up to 6 units in a stack, which allows it to provide up to 144 GE ports, 12 available 10G SFP+ uplinks and 768Gbps switching capacity, offering high-density developments as well as flexibility for future network expansion need. The T1700G-28TQ supports IP-MAC-Port Binding, Port Security, Storm control, and DHCP Snooping, which help to protect the network from broadcast storms, ARP attacks, and more. And the switch supports 802.1X, which allows network clients to be authenticated through external Radius servers and the guest VLAN function allows non-802.1X clients to access specific network resources. The T1700G-28TQ is easy to use and manage. It supports various user-friendly standard management features, such as intuitive web-based Graphical User Interface (GUI), industry-standard Command Line Interface (CLI), SNMP (v1/2/3), and RMON. This allows the switch to provide valuable status information and send reports on abnormal events. Comprehensive IPv6 support management ensures a smooth migration to an IPv6-based network. It also supports Dual Image to provide improved reliability and network uptime. As being mentioned, the TP-Link T1700G-28TQ has 24 10/100/1000Mbps RJ-45 ports and 4 dedicated 10G SFP+ slots to achieve network connectivity. And it is a switch supports different optical modules and network cables. For the 10/100/1000Mbps RJ-45 ports, you can use 100BASE-TX or 1000Base-T optical transceiver with UTP category 5, 5e or above cable (maximum 100m) to achieve the link. Besides, you can also use 1000BASE-X with singlemode or multimode fiber cable to connect. As for the 10G SFP+ ports, there are two approaches to achieve transfer the data. You can choose 10G optical transceivers or 10G DAC cables to transfer data. The TP-Link T1700G-28TQ support 10BASE-T with UTP category 3, 4, 5 cable (maximum 100m), 10GBASE-LR and 10GBASE-SR to connect. In addition, you can use TP-LINK TXC432-CU1M or TP-LINK TXC432-CU3M to achieve the link. TP-Link T1700G-28TQ provides cost-effective solution for 10G SMB networking. This article mainly discussed about its definition, features and benefits as well as compatible optical modules and cables. If you are looking for its compatible optical modules and cables, FS.COM is a nice choice. Broadcom or Intel Network Adapter for Dell PowerEdge Server? The NDC, Network Daughter Card (also known as Select Network Adapters), is an innovation technology developed by Dell. As an advanced technology on server, the NDC provides the customers with a flexibility of choosing what they want ( 4 x 1GbE, 2 x 10GbE or 2 x Converged Network Adapter.) With this small, removable mezzanine card, we are no longer limited to use network interface cards (NICs) on the motherboard. And it has been used in the twelfth-generation Dell PowerEdge server. This article will focus on Broadcom or Intel network adapter for Dell PowerEdge Server. Network adapter plays an irreplaceable role in a server system, as it can reduce CPU usage on the server, which improves the overall system performance. NDC is a paramount member of Dell PowerEdge Select Network Adapters family. There are two form factors of Select Network Adapters—blade servers and rack servers. (You can see the two servers clearly in the following figure.) The Blade Select Network Adapter provides dual port 10GbE from various suppliers. The Rack Select Network Adapter provides a selection of 1GbE and 10GbE port options, such as 1000Base-T, 10GBASET and 10Gb SFP+. The Blade Select Network Adapter is offered on the PowerEdge M620 blade server. Blade servers: There are three form factors of blade servers offered by Dell: Intel x520 Dual Port 10Gb KR NDC, Broadcom 57810S Dual Port 10Gb KR NDC, and QLogic QMD8262-k Dual Port 10Gb KR NDC. Both the Broadcom and Intel blade NDCs will support both 1Gb and 10Gb speeds, while the QLogic blade NDC will run only at 10Gb speeds. Intel Ethernet x540 Dual Port 10Gb BT + i350 DP 1Gb BT NDC: A quad-port rack NDC with 2 ports x 1GbE + 2 ports x 10GBASE-T based on the Intel I350 and x540 chipsets. Intel Ethernet i350 Quad Port 1GbE NDC: A quad-port rack NDC with 4 ports x 1GbE based on the Intel I350 chipset. An Intel 2x1Gb + 2x10Gb Base-T rack NDC, as shown in the following figure, offers two types of interconnects to meet various connectivity needs. Broadcom 57800S 2x1Gb+2x10Gb SFP+ NDC: A quad-port rack NDC with 2 ports x 1GbE + 2 ports x 10G SFP+ based on the Broadcom 57800S chipset. Just shown as the following figure. Broadcom 5720 4x1Gb Base-T NDC: A quad-port rack NDC with 4 ports of 1GbE based on the Broadcom 5720 chipset. How to Choose the Optical Cables and Modules for Broadcom or Intel Network Adapter? Just take Broadcom 57800S 2x1Gb+2x10Gb SFP+ NDC for example. A Broadcom 2 x 1G + 2 x 10G SFP+ NDC provides two 1000BASE-T ports and two 10G SFP+ ports as shown in Figure 6. We can plug two Dell compatible SFP transceivers into the two 1G ports on the Broadcom NDC respectively to achieve 1G network connection. Likewise, we can also connect Dell compatible SFP+ transceiver such as 10Gb Base SR connector to the 10G port on the Broadcom card for making 10G data transferring. Besides, we can also use Direct Attach Cable (DAC) to achieve 10G network connectivity, such as multimode 10Gb fiber optic cable, Dell 10G SFP+ DAC cable. DAC cables provide a cost-effective solution for very short transmission while 10G optical modules are more suitable for data transferring over long distance. As technology advanced and 10Gb Ethernet became more prevalent in the data center, there must be a prosperous market ahead for blade servers and rack servers. SFP+ modules and Direct Copper Attached is the current preference for 10GbE connectivity of rack servers. Boardcom and Intel are both famous vendors for providing NDCs for Dell PowerEdge Server, you can select a proper one for your server according to your port needs. With the wide deployment of 40 Gigabit Ethernet, the 40G QSFP+ direct attach copper cables are becoming more and more popular due to the compact size, low power and cost-effectiveness. 40G QSFP+ to QSFP+ direct attach copper cables and 40G QSFP+ to 4 x 10G SFP+ direct attach cables are hot pluggable and parallel passive/active copper cables for storage, data, and high-performance computing connectivity. QSFP+ to QSFP+ direct attach copper cables are hot-removable and hot-insertable. A cable consists of a cable assembly that connects directly into two QSFP+ modules, one at each end of the cable. The cables use integrated duplex serial data links for bidirectional communication and are designed for data rates up to 40 Gbps. QSFP+ to QSFP+ direct attach copper cables are suitable for very short distances and offer a highly cost-effective way to establish a 40G link between QSFP+ ports of QSFP+ switches within racks and across adjacent racks. These cables connect to a 40G QSFP port of a switch on one end and to another 40G QSFP port of a switch on the other end. The move from 10G to 40G Ethernet will be a gradual one. It is very likely that one may deploy switches that have 40G Ethernet ports while the servers still have 10G Ethernet ports. For that situation, we should use a QSFP+ to 4 SFP+ direct attach breakout copper cable. These cables connect to a 40G QSFP port of a switch on one end and to four 10G SFP+ ports of a switch on the other end, which allows a 40G Ethernet port to be used as four independent 10G ports thus providing increased density while permitting backward compatibility and a phased upgrade of equipment. The 40G QSFP+ direct attach cables are used to connect switch to switch or switch to server. When we use a fiber optic transceiver and patch cable to establish a fiber link, we should firstly plug the transceiver to the network switch and then plug the patch cable to the transceiver. But for a QSFP+ direct attach copper cable, both SFP+ connector and QSFP+ connector can be directly inserted into the switch and don’t need a transceiver at all, which provides a really cost-effective solution for interconnecting high speed 40G switches to existing 10G equipment or 40G switches to 40G switches. 40G QSFP+ direct attach cables can provide inexpensive and reliable 40G speed connections using copper cables with distances reaching up to 30ft (~10 meters length). Cost of short reach connectivity is significantly reduced by avoiding the more costly fiber transceivers and optical cables. As the main fiber optical manufacturer in China, FS provides a good selection of 40G QSFP+ copper cables, both passive and active copper cables are available. For longer distances, active copper or optical cables are required. For more information or quotation, please contact us via sales@fs.com. Existing and emerging network technologies are driving the need for high-density optical connectivity solutions to address the trends to optimized cable management and data center real estate usage. In order to satisfy the demands of higher bandwidth and more applications in a variety of cloud computing environments, active optical cable (AOC) has emerged. This article will introduce a very popular type of AOC —40G QSFP+ AOC in data center applications. 40G AOC, is a type of active optical cable for 40GbE applications that is terminated with 40GBASE-QSFP+ on one end, while on the other end, in addition to QSFP+ connector, it can be terminated with SFP+ connector, LC, SC, FC, and ST connector etc. The 40G QSFP+ AOC is a parallel 40Gbps quad small form factor pluggable (QSFP+) active optical cable, which supplies higher port density and total system cost. 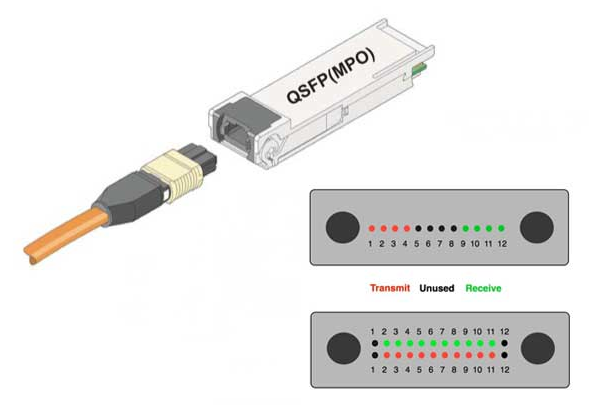 The QSFP+ optical modules provide four full-duplex independent transmit and receive channels, each are able of 10Gbps operation 40Gbps aggregate bandwidth of at least 100m multimode fiber. Most DAC assemblies have one module on each end of the cable. But there is a special kind of DAC assembly which may have 3 or 4 modules on one end of the cable. For instance, Cisco QSFP-4X10G-AOC5M compatible QSFP+ to 4SFP+ breakout AOC from Fiberstore has a single QSFP+ module rated for 40-Gbps on one end and four SFP+ modules, each rated for 10-Gbps, on the other end. Active Optical Cable (AOC) is used for short-range multi-lane data communication and interconnect applications. It uses electrical-to-optical conversion on the cable ends to improve speed and distance performance of the cable without sacrificing compatibility with standard electrical interfaces. The 40G QSFP+ AOC is a high performance, low power consumption integrated cable for short-range multi-lane data communication and interconnect applications, supporting 40G Ethernet, fiber channel and PCIE. It is compliant with the QSFP MSA and IEEE P802.3ba 40GBASE-SR4. It integrates four data lanes in each direction with 40 Gb/s aggregate bandwidth. Each lane is capable of transmitting data at rates up to 10Gb/s with lengths ranging from one to 100 m. With its benefits, 40G QSFP+ AOC is widely used in many fields as well as promoting the traditional data center to step into optical interconnection. Cost: 40G AOCs cost lower than SR4 modules and do not need to use with extra fiber patch cables. For instance, HP 720205-B21 compatible QSFP+ to QSFP+ active optical cables are suitable for very short distances and offer a very cost-effective way to establish a 40-gigabit link between QSFP ports of HP switches within racks and across adjacent racks. Besides, when using 40G AOC, there are no cleanliness issues in optical connector and there is no need to do termination plug and test when troubleshooting, which can help user save more time and money. Insertion Loss & Return Loss: Under the same case of transmission distance, the repeatability and interchangeability performances of SR4 module interface are not good as 40G AOC. What’s more, when different fiber optic patch cables plug into the module, it will have the different insertion loss and return loss. Even for the same module, this issue is existed. Of course, the related metrics such as the testing eye pattern will have no significant changes so long as the variation in and conformed to the scope. In contrast, an AOC with good performance is more stable and has better swing performance than SR4 modules in this situation. Fiberstore’s AOCs achieve high data rates over long reaches which are the best solutions for high-performance computing and storage applications. We supply AOC products such as 10G SFP+ AOCs, 40G QSFP+ AOCs, QSFP+ to 4 SFP+ AOCs, QSFP+ to 8 x LC AOCs and 120G CXP AOCs etc. In addition, custom cables are also available in various lengths. Recently, Fiberstore has cut the price of its direct attach cable (DAC) products in order to offer a more cost-effective high speed transmission solution for the old and new customers. With the growth of bandwidth-intensive applications such as high-performance computing and business continuity, there emerge higher-speed networks of 40/100G Ethernet. And as products become less expensive and more available over time, 40/100G Ethernet will inevitably be commonplace in our daily life. Therefore, it is necessary to create a migration path by installing a structured cabling system that can support the future 40/100G networking needs. In this system, such fiber optic products as MTP/MPO assemblies, 40/100G transceivers and 40/100G direct attach cables (DACs) are important components. This article will discuss their roles in 40/100G Ethernet migration respectively. Since 40/100G Ethernet uses parallel optics technology which requires data transmission across multiple fibers simultaneously, the multi-fiber connectors are needed. MTP/MPO is the designated interface for multi-mode 40/100G Ethernet, and its backward is compatible with legacy 1G/10G applications as well. 40G Ethernet uses a 12 position MTP/MPO connector interface that aligns 12 fibers in a single row. And the 4 leftmost fibers are used to transmit data, the middle 4 fibers are left unused, while the 4 rightmost fibers are used to receive data. 100G Ethernet uses a 24 position MTP/MPO connector with two rows of 12 fibers. And the outermost fibers on either end of the rows are vacant, while 10 fibers in the upper row for transmitting data and the remaining 10 fibers in the lower row for receiving data. Together with MTP/MPO connectors, 40/100G transceivers are often used (as shown in the above figure). Through the use of plug-and-play, hot-swap transceiver miniaturization, fiber connectivity in higher-speed active equipment is being condensed and simplified. Transceivers used in 40/100G Ethernet migration include 40G QSFP+ transceivers, 100G CFP transceivers and so on. 40G QSFP+ transceivers can support 4x10G modes, which allow new parallel optics active equipment being compatible with existing 10G transceivers. And the electrical connection of a 100G CFP transceiver uses 10x10G lanes in RX (receive) and TX (transmit) direction, supporting both 10x10G and 4x25G variants of 100G interconnects. To save cost, 40/100G DACs are often used in 40/100G Ethernet instead of optical transceivers. Applied to short reach applications, it is a fixed assembly supporting high speed data that uses a small form-factor connector module as an optical transceiver on each end of a length of cable. The modules on each end meet small form-factor standards and have some function of the optical transceivers, meaning that DAC inherits some advantages of the small form-factor module. Thus, sometime there is no need to upgrade the equipment by using a DAC. To meet the future 40/100G networking needs, the cabling system shall include components that not only support future high-bandwidth applications but also be compliant to 1G and 10G applications and all current and anticipated industry standards. Meeting all these requirements, the above mentioned MTP/MPO connectors, 40/100G transceivers and 40/100G DACs play important roles in migration to 40/100G Ethernet. As a professional supplier of fiber connectivity network solutions, Fiberstore supplies all these fiber optic products and other kinds of products for 40/100G Ethernet migration.